With two series in the books for the Oregon Ducks baseball team, how close do the actual performances rank against the expectations coming into the season? Across the board we have seen outstanding performances from the projected stars as well as solid play from some players who are looking to make sure their names are in the conversation — most notably Conor Harber, who received Pac-12 Pitcher of the Week honors after his impressive performance against New Mexico State. The player who received the most pre-season excitement was one we hadn’t had a chance to see play in more than a year. Pitcher Cole Irvin spent the 2014 season rehabbing after Tommy John surgery following a phenomenal freshman season. While head coach George Horton is going to keep Irvin on a pitch count for the foreseeable future, he has still been able to make an impact in his limited role. Over seven innings (two appearances) Irvin has held down a 1.29 ERA, issuing a single walk while striking out five. As the season moves along Irvin can only improve as he returns to full strength. Freshman David Peterson has lived up to his pedigree thus far, leading the team in strikeouts — 15 over 11.1 innings of work. 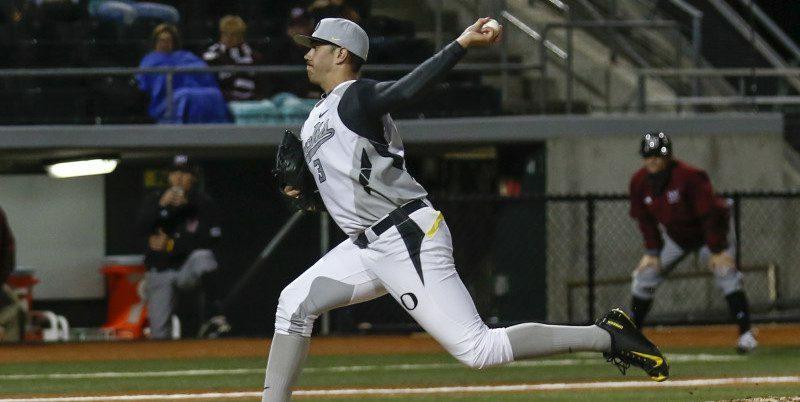 While he can still improve his control — he has walked five batters — Peterson’s opponents are batting only .154 against him, so he has the stuff to be a big time contributor for the Ducks. Transfer student Phil Craig-St. Louis is a big bat for the Ducks. Designated hitter Phil Craig-St. Louis transferred to Oregon from Seminole State College in Seminole, Oklahoma, and has enjoyed success in the lineup. While batting .389 and driving in six runs (second behind third baseman Matt Eureste‘s nine), Craig- St. Louis has also drawn four walks, en route to posting an impressive .500 on base percentage. 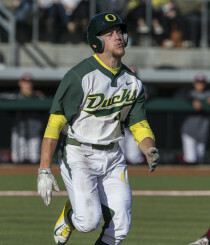 Behind Irvin, the most anticipated returning player was second baseman Mitchell Tolman, a third team pre-season All American who moved over from third base last offseason. The change hasn’t slowed Tolman down – he has ripped eight hits over his 24 official at bats (.333), driven in six runs, drawn a team-leading eight walks and swiped two bags in as many attempts. As a team the Ducks are doing all the small things well, allowing them to put up the huge offensive numbers we are so fond of seeing. While individual performances power the Ducks ahead, the unit as a whole is benefitting. The Ducks have outscored opponents 61-28 and are keeping them off the basepaths, holding them to a .295 obp and .204 batting average. The Ducks will look to continue their dominance tonight against Portland at 6 p.m. before heading to California to take on UCSB.